During an off-the-record luncheon on Thursday last week with Republican Senate aides, former White House counsel Don McGahn made several revealing remarks about how the White House operates — including some details that could be made more public once the Mueller report is released. “I spent the last couple of years getting yelled at. And you may soon read about some of the more spirited debates I had with the president,” McGahn explained, according to a report from Axios. Although McGahn didn’t explicitly state that he was referring to the Mueller report, it was heavily implied that’s what he had meant. Axios based its report off of two sources who were at the event. 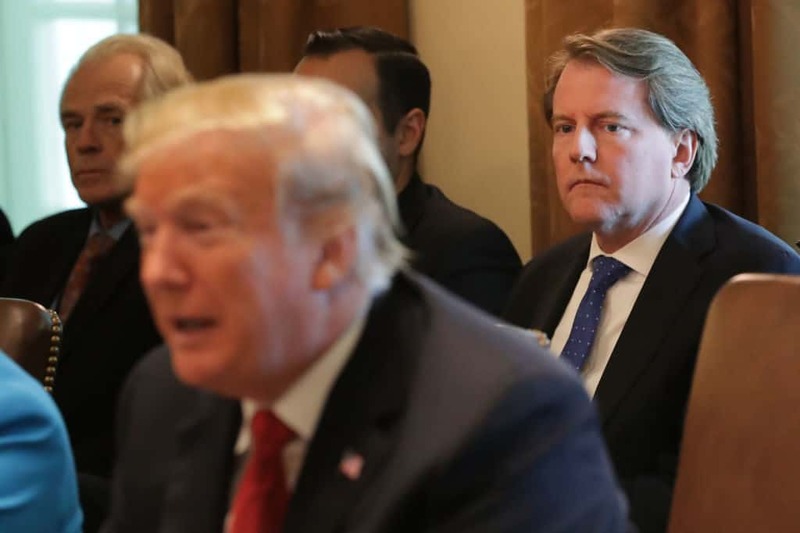 McGahn’s discussions with Trump could be heavily cited in the report, especially with regard to whether the president had tried to obstruct justice or not. As the White House counsel, it was McGahn’s duty to advise the president on the legality of his decision-making methods. There were several other remarks that McGahn made that helped shed some light on how the White House operates under Trump’s watch. The president distrusts “gatekeepers,” McGahn explained, and doesn’t like having his chief of staff operate in the traditional sense that the position has performed under in previous administrations. The president, McGahn added, instead operates under a “hub and spokes” model of leadership — he prefers to have everyone report to him, and often assigns the same task to two or more people. McGahn also explained that Trump’s penchant for speaking without thinking often made things difficult for him. It was important for McGahn to get to the president before he made an announcement on a subject, the former White House counsel said, especially if the decision was based on faulty information. Once an announcement was made by Trump, it was difficult to get him to change his mind on the matter, the sources claim McGahn said. In spite of the lamentations of how he said the White House operated, the former White House counsel’s opinion of Trump was mostly positive during the luncheon — especially since, the sources explained, he understood that Trump was appointing conservative judges to rule on appeals courts for the next 30 to 40 years, they said.